One of my favorite things to make in my crockpot is soup. It’s filling, packed with veggies, and absolutely delicious. I also love assembling and freezing crockpot meals for later. 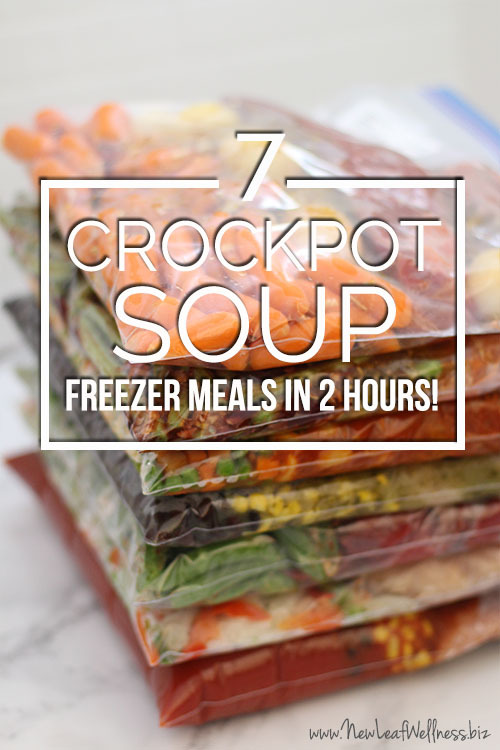 Since crockpot freezer meals don’t require any cooking ahead of time, they’re super easy to prep and cook for the first time out of the crockpot and not like leftovers at all. Yay! 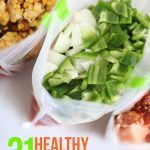 I decided to combine my loves for soup and crockpot freezer meals into one and create a list of delicious crockpot soup recipes that freeze great. These are all healthy meals that my family loves. I love the idea of devoting two hours on the weekend to making all seven at once. Then we’d be stocked with healthy meals for busy weeknights. Print the recipes and grocery list ahead of time and go shopping. 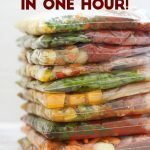 Label all the freezer bags with the name of the recipe, cooking instructions, and use-by date (which should be 3 months from the prep date). Fill the bags with the veggies at the bottom, sauces and spices in the middle, and meat at the top (so it’s the first ingredient dumped into the crockpot). Seal and stack in the freezer. Then, when you’re ready to eat, thaw them overnight in the refrigerator or in the morning in water and then cook for about 8 hours on low. Add some fresh bread and dinner is done. I would love to hear from someone who has actually made these soups and can tell me how they taste. 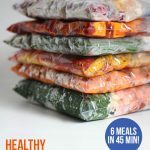 I’ve done a lot of freezer meals and just b/c they’re frugal and easy doesn’t mean they’re good. Sorry…don’t mean to sound harsh. Thank you! I’ve made them all and they’re delicious. 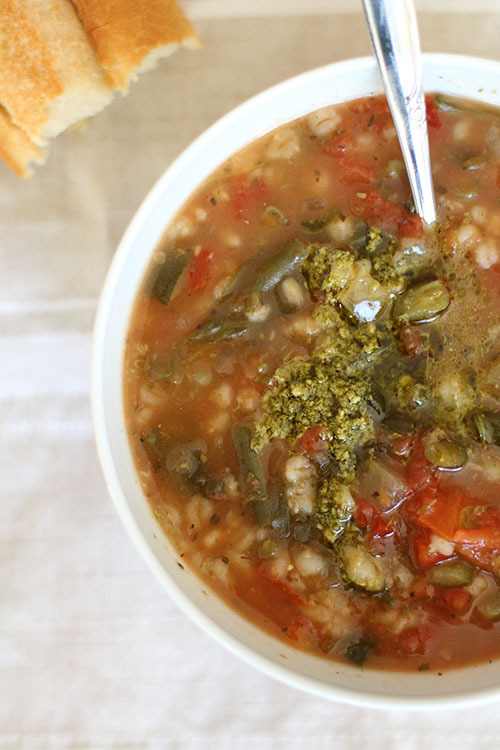 I have made and love the veggie pesto soup! My 5 picky eater kids love it too. The sixth child is nursing, but I am sure he will like it too. We try to use BPA free cans, and organic or home made ingredients as much as possible. Minestrone is on the menu today. We have really enjoyed all of the recipes so far. Yay! I’m so glad. It sounds like you have a wonderful family, Silver. Just chiming in…I’ve made the Meatball Vegetable Soup as well as the Vegetable Minestrone Soup. Both are delicious and so good I would gift it to someone in need. 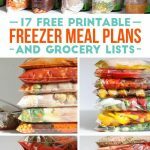 New Wellness has the best freezer meals I’ve ever tried…no lie. I’ve been let down too by other Pinterest fails. We’ve probably made close to 20 of her meals at this point. I’ve only had 1 miss, and I think that was more our deal than the recipe. My husband also tends to be anti-crockpot but he enjoyed these recipes especially the meatball soup! Yum. That’s one of our faves too. I may be missing this somewhere, but am I not supposed to brown the meat first?